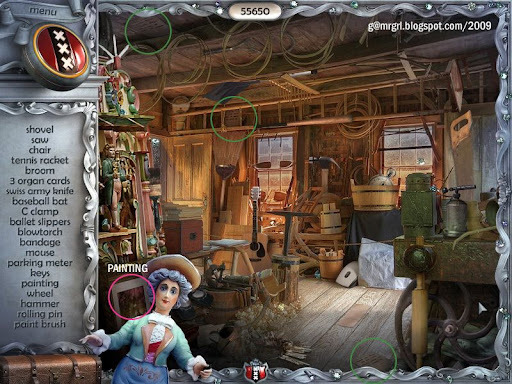 There is a compass located at the top left of the screen to help find items. 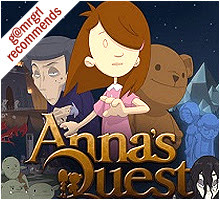 When clicked, it forms a largish circle around the item, which is located in the approximate middle. The compass reveals items randomly in case there are two or more items left on the list. 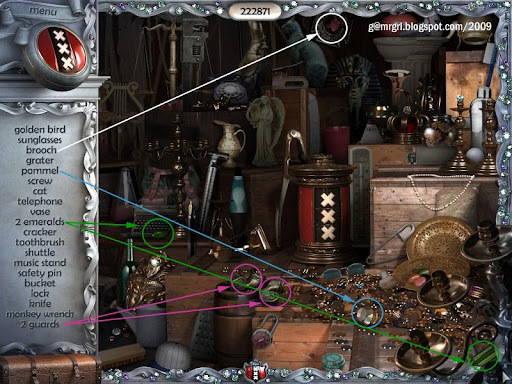 There are numerous small diamonds strewn across each screen that can be used to recharge the compass in a rush – just click on them. Otherwise the compass recharges slowly on its own, indicated by the yellow line around its border. 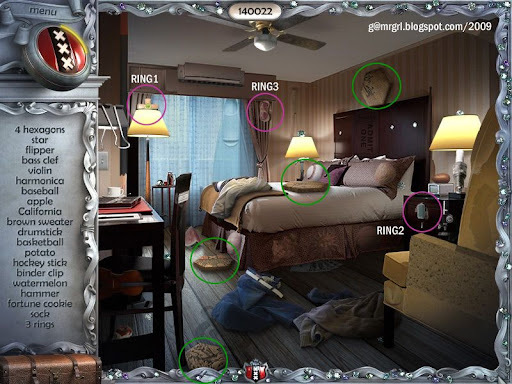 The inventory (the trunk at the bottom left) has items that are used to solve puzzles at different points of time. You don’t have to do anything; the game decides which items are to be used when. Too much random clicking causes the mouse to move on its own accord for a few seconds. Some of the puzzles have a hint option (available on the right side of the screen during the puzzle scenes). Using a hint costs points, but may get you out of a bind. Some of the puzzles are random-generated, and your solution may not match mine. 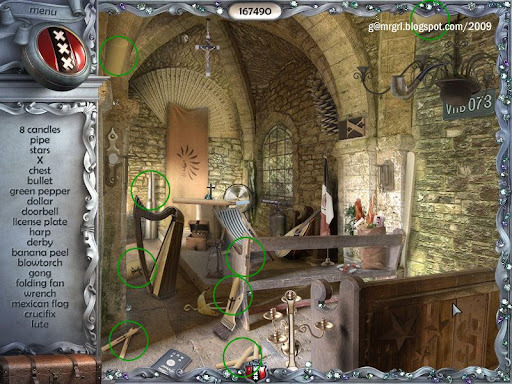 Only puzzle-related hidden objects are marked in the screenshots, not the randomly-generated items. There is no timer in the game. 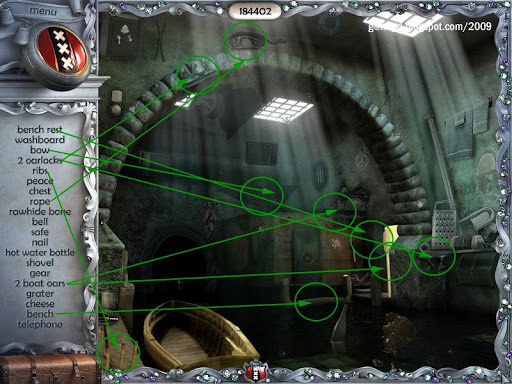 There is no way to exit a puzzle screen unless you exit the game altogether, in which case the puzzle resets and starts from scratch. 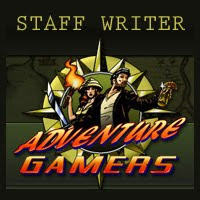 For more detailed instructions and hints on game-play, get the official Strategy Guide. Platform 3A: Find where to spend the night, and the compass. The brochure gives the address of hotel in the city. Hotel Room: Find 10 pieces of paper, 2 rings and 2 paintings. The 10 pieces of paper are a map instructing you to go to Magere Brug. Solution: This is quite simple; first place the corner pieces and then the side pieces, and then the middle pieces. The pieces snap to the board when they are in the correct position. 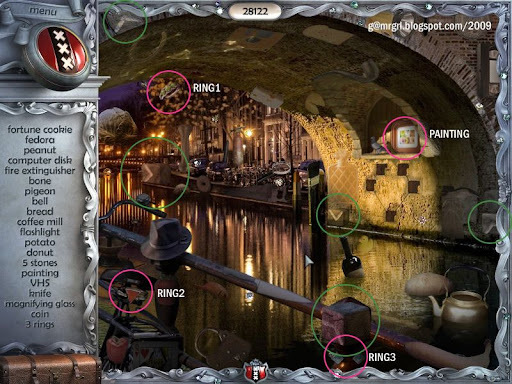 Magere Brug: Find 5 stones, 3 rings and 1 painting. 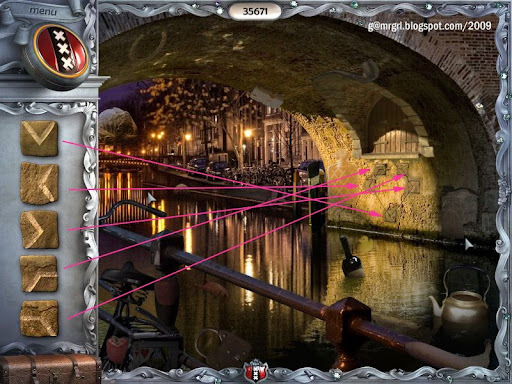 Mini-game: The stones and the holes under the bridge. Solution: The aim is the fix the stones with the lines in them so as to complete the diamond shape outline of the holes. Take the set of keys labelled Carre. Carre Theatre: The door is locked and the keys need specific instructions to open it. Solution: Look at the three scratches on the white panel next to the door. All three keys need to be at that angle to open the door. Rotating the top key also rotates the middle key. Rotating the middle key also rotates the top and bottom keys. This is a random puzzle - the solution depends on how your keys are initially placed, and hence there's no single answer. 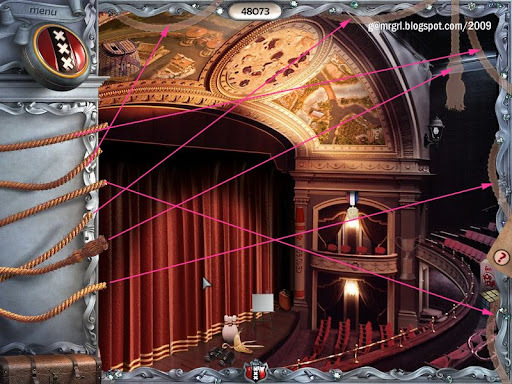 Inside The Theatre: Find 6 ropes and 2 paintings. Solution: This is easy, since the ropes snap into place only when correct, so it can be done by trial and error if not educated guessing. 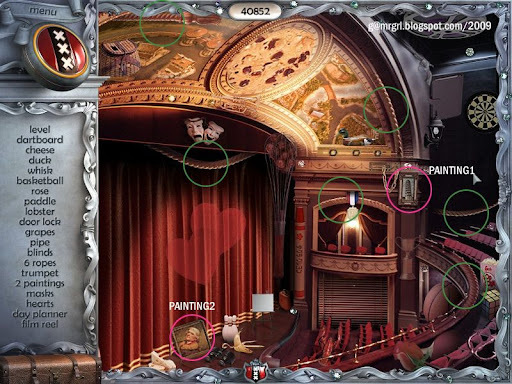 Organ Repair Shop: Find 3 organ cards and 1 painting. Solution: The colours are important. The game starts with the blue card, then yellow, then red, working one at a time. The aim is to compare the buttons on the organ, numbered from 1 – 12, with the organ card references, which are number I to XII, i.e. 1 – 12 in Latin. The small dash means that button is set in, the long dash means that the button is set out. So “1-small dash” on the blue card means that button 1 of blue colour is set on the inside position. 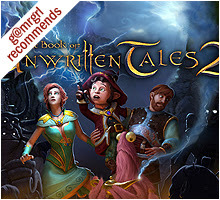 Click a button to change its position. Creepy Place: Find 5 bouquets, knife tip, white rose and 1 painting. Read the message on the rose. Flower Market: Nothing particular here, random items only. Solution: The aim is to place the bouquets from the creepy place into the correct buckets while keeping the total marked price accurate. 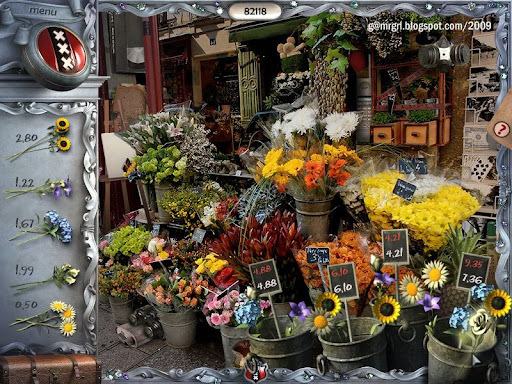 This puzzle requires a bit of back-and-forth and there is no direct strategy per se - I started with the 4.21 and 4.88 buckets, which seemed to have the least flowers required, and finished with the 9.35 bucket. 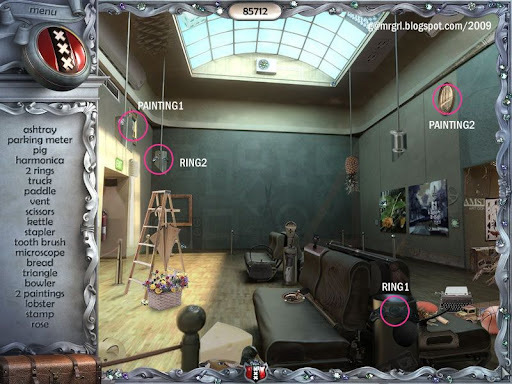 Rijksmuseum: Find 2 rings and 2 paintings. Solution: The paintings have to be replaced at their original locations as marked by their outlines. Start with placing the circular and diagonal paintings, then the ones with the odd frames, and then the rest. The painting without the frame goes into the frame behind the ladder. Take the amulets. Amsterdam is like a diamond. 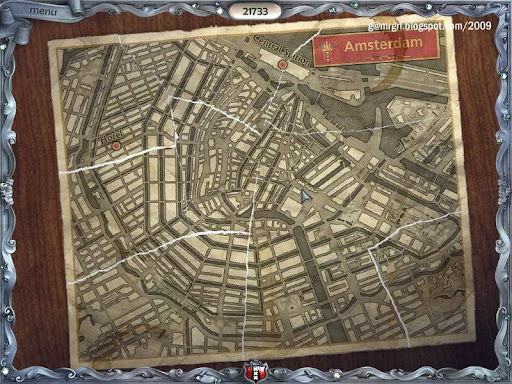 Mini-game: Place the amulets on the map for the next location. 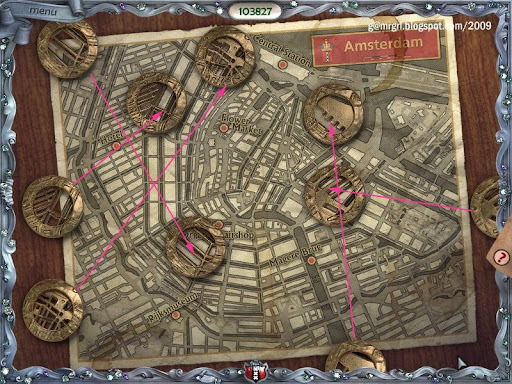 Solution: The amulets have the road patterns on them and have to be placed where their patterns match the road network on the map. If an amulet is placed correctly, it will lock in. The Maritime Museum: Nothing particular here, random items only. 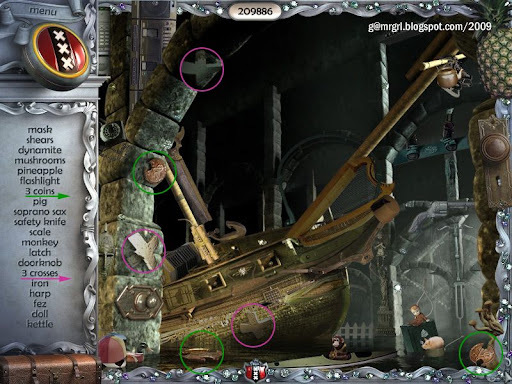 Batavia: Find 10 code snips and 1 wooden chest. Solution: First, recreate the code from the code snips. The three results to get via the mathematical equations listed above the code are: 18, 56 and 5. 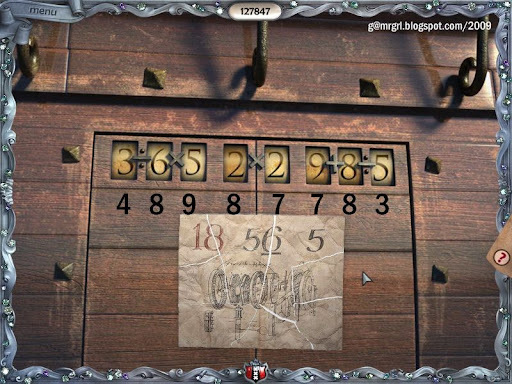 Hold and drag each number of the equation panel to change it; this process is a little cumbersome, but there are only four numbers in each slot, so overall rotations are few. 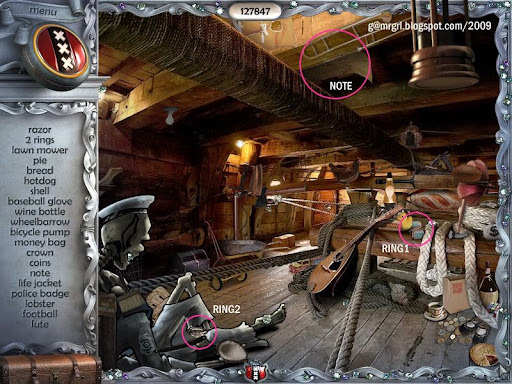 Cargo Hold: Find 2 rings and 1 note. Hotel Lobby: Find 4 hexagons and 12 keys. Mini-game: Find the right key. 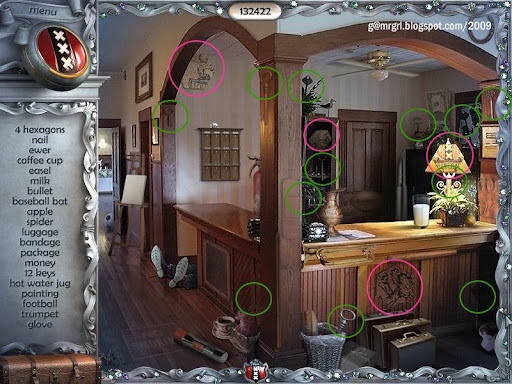 Solution: Use the silhouettes of the keys to put them in the right slots. Start with the two smallest keys, then the two keys with two round holes in the head, and the two keys with the solid heads. Then do the rest. Once the keys are in the right slots, they will sparkle. This is also a randomly generated puzzle. Click here for my solution. Hotel Room: Find 4 hexagons and 3 rings. 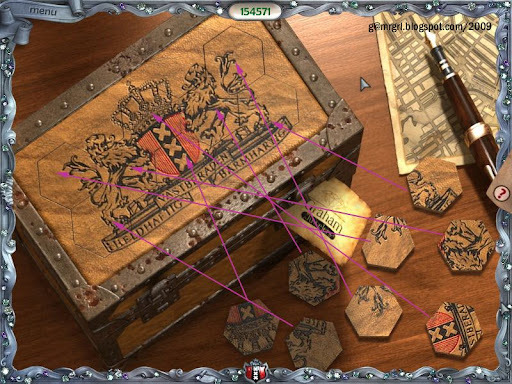 Mini-game: Use the hexagons to open the wooden chest. Solution: The hexagons have to be placed in their slots on the box. Some of the hexagons need to be rotated into place. First place the hexagons with the red colour in them, then the hexagons with text, and finally, the rest. 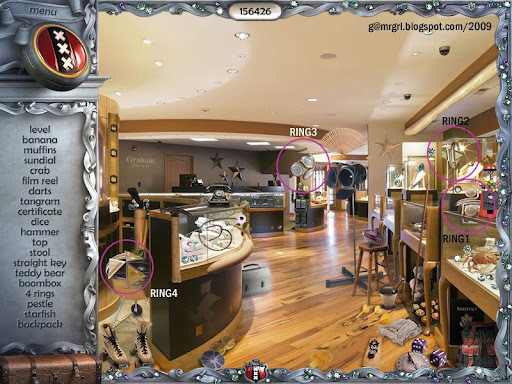 Graham Jewellers: Find 4 rings. 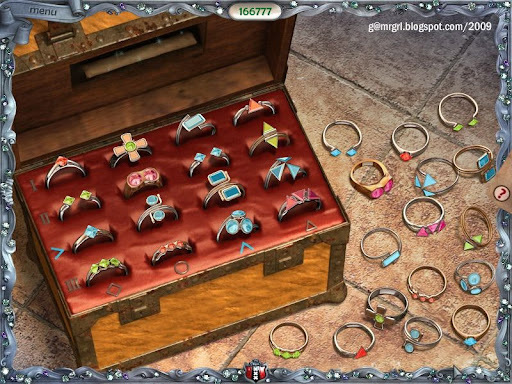 Mini-game: Put the rings inside the wooden chest. 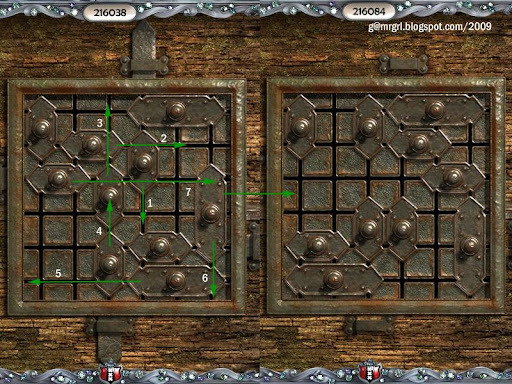 Solution: This is a slightly complex puzzle – first, the layout of the chest has to be understood. The topmost row says I – which means it can only have rings with a single stone. The second row says II – only rings with two stones. The third row says blue – only blue rings. The bottom row says III – only rings with three stones. Column 1 (from left) will take only diamond cut stones. Column 2 will take only circular stones. Column 3 will take only blue stones. Column 4 will take only triangular stones. Now place the stones which are NOT BLUE into their respective slots using the number of stones + colour combination. This removes clutter. Then put the blue ring with a single diamond cut stone in row 3, column 1. So then the OTHER blue ring with a single stone goes into row 1, column 3. Put the blue ring with three triangular stones in row 3, column 4. Then the blue ring with the three circles in row 4, column 3. The rest should be easy to place now. The Damrak: Find 8 candles. 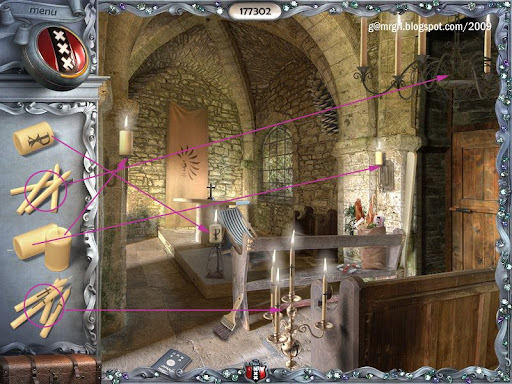 Solution: The candles have to be placed in the various holders around the church. This is not difficult as the candles snap to screen when they’re correctly placed, and also get lit. Solution: The point is to align the doors on each corridor (which have white marks on either side) with the white marks on the left wall of that corridor. 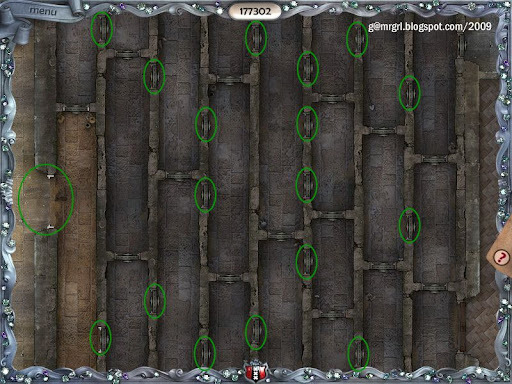 Each wall may have two or more doors to be aligned with. Slide the corridors up and down by keeping the mouse pressed to align the doors. 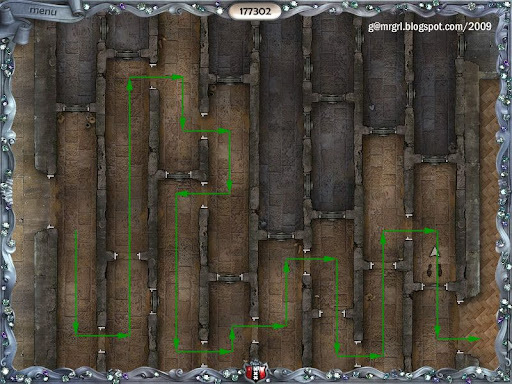 This puzzle is not difficult because only one corridor moves at a time, and once it’s done, it locks in place. 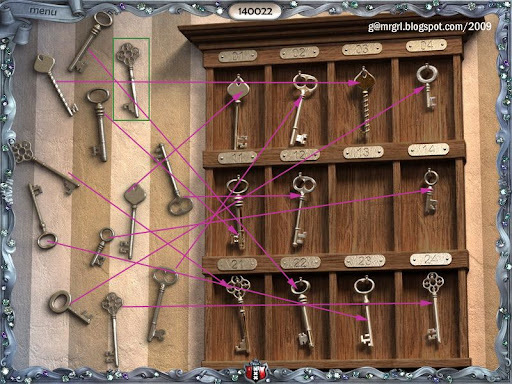 Mini-game: Navigate the maze to the brown door on the right. 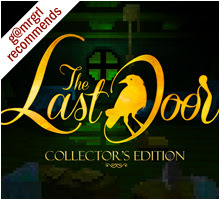 Solution: The feet have to be guided through the maze by clicking on the cursor signs that appear around them when they are next to a door. Click on a door to open it; only some doors open, the rest are locked. Choose carefully, because it IS possible to go down the wrong alley and end up at the wrong last door. 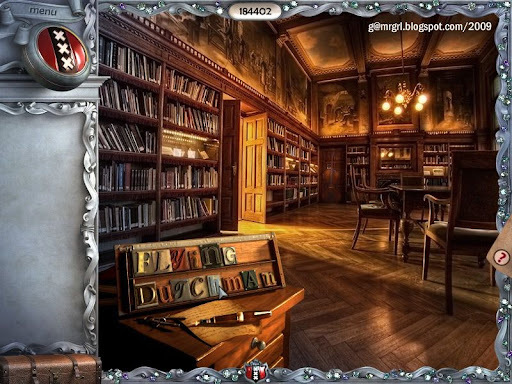 The Underground Library: Find 14 letters (alphabets). 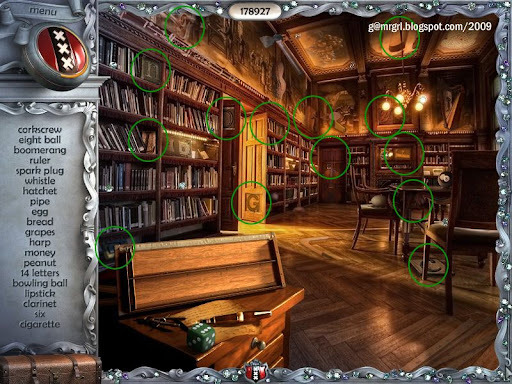 I had a lot of trouble with this screen and had to use the hint several times; it also has what appears to be a plunger marked as a ‘spark plug’ and a cigarette hidden among the books that I could barely locate even with the hint. Solution: The alphabets have to be arranged in two rows to form logical words / sentence(s). Four alphabets are placed from before. There are 14 alphabets and 16 slots. So there are two spaces, but they can be anywhere and break up the word(s) anyhow. I had to look at the hint– which basically gives out the whole answer – for this, because I could see no logical way to figure this out. Even after I knew the word, it meant nothing to me in the context of the game up to this point, except for the obtuse Holland-Amsterdam-Dutch connection. The Underground Canal: Find 2 oarlocks, 2 oars, 1 rope, 1 ribs, 1 bench rest, 1bench and 1 bow (of the boat). Solution: Drag the parts of the boat to it. This is not difficult as the parts snap to screen when they’re correct. The three unusual parts – bench rest, bow and ribs - are marked in the solution, the rest are obvious. 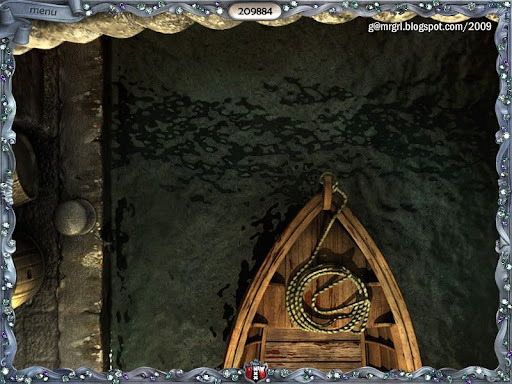 Mini-game: Row the boat to the tunnel. Solution: This is a broken up image jigsaw that needs to be fixed – click on two pieces one after the other to swap them. When the pieces are in place, they will get deactivated. Since the boat is entering the tunnel, remember, the stones are overhead! Work on the top, then the left side, then the boat – the water slides should be the last to be matched. 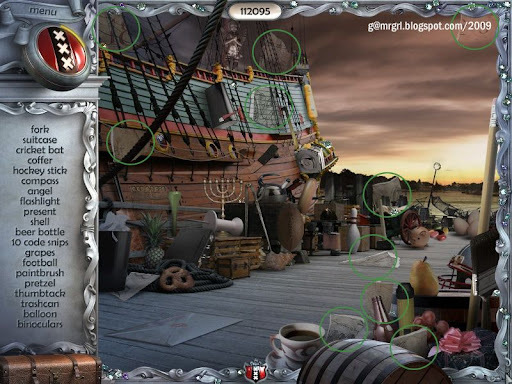 The Flying Dutchman: Find 3 coins and 3 crosses. Solution: This is a slider puzzle – the knobs inside the square need to be moved around to release the 4 latches. There are several ways of doing this, my key moves are listed. 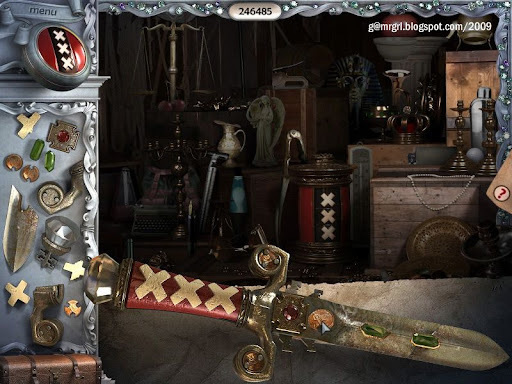 Treasure Room: Find 2 emeralds, 2 guards, 1 pommel, 1 brooch. Read Willem van der Dekken’s journal. 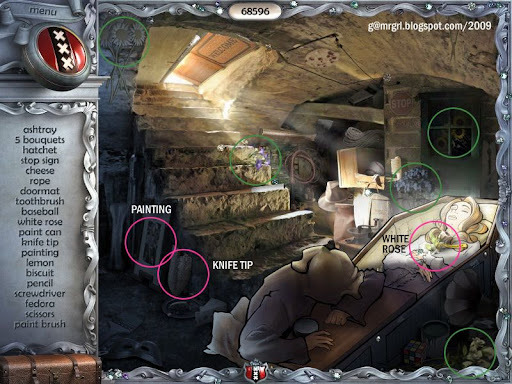 Solution: Another drag-and-drop puzzle, the idea is to fit the pieces onto the knife. But this has a sequence – the pommel has to be added before the guards can be added. The rest of the pieces are obvious. 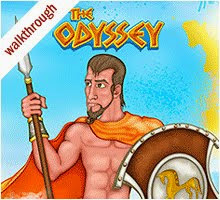 This is an original walkthrough written by me. Please do not distribute / adapt the text and images in any way without my written consent.